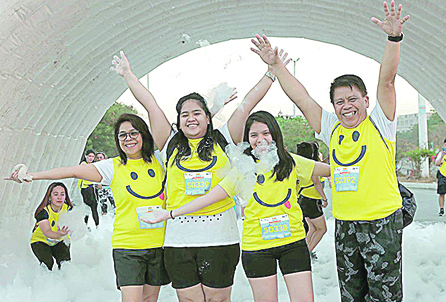 The Philippines is the 69th happiest country in the world, a United Nations report released on Wednesday―the International Day of Happiness―said. With an average score of 5.631 in 2019, the Philippines moved up two places from last year or 71st out of the 156 countries ranked. The country ranked higher than Southeast Asian neighbors Malaysia (80th), Indonesia (92nd), Vietnam (94th), Laos (105th), Cambodia (109th) and Myanmar (131st). The polling firm noted that the ranking is the country’s lowest in four years since recording 85 percent in December 2014. The SWS survey also found 82 percent “very or fairly satisfied” with the lives they lead. The World Happiness Report 2019 used survey data asking citizens across the world how happy they perceive themselves to be, as well as measures such as life expectancy, income and social support. Finland ranked as the world’s happiest country for the second year running, while war-torn South Sudan sank to the least contented in the UN survey. The Nordic nation of 5.5 million people, known for their love of forests, lakes and saunas, topped the study. The other Nordic countries, as well as the Netherlands, Switzerland, Canada, New Zealand and Austria, also made the top 10. The five largest declines since 2005 were in Yemen, India, Syria, Botswana, and Venezuela.